Just been reading Web Bike World and it would appear that Honda have recently patented a six cylinder cafe racer/race replica, no displacement as yet but the accompanying graphics do look rather nice. They did one years ago 6 cyl 1000cc I think it was the cbx beautiful sound. Neither of the road-going Honda 6's ( the inline CBX 1000 and the opposed flat configured Valkyrie) were a great commercial success for Honda, so why would they think that tastes have changed? Although, I must confess that if they ever made a replica of the Moto Martin CBX, I would be seriously tempted. 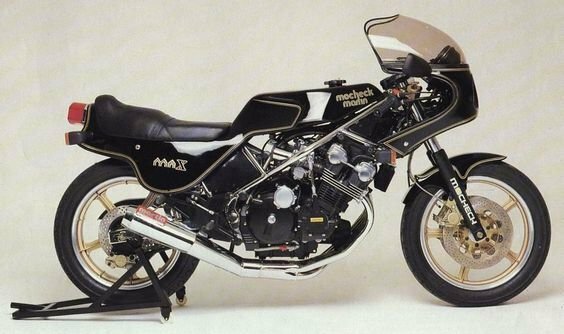 The CBX 1000 in the early 80s was a smooth engine and they went well enough, but the six cylinder engine was wide and in the unfaired CBx it was not fantastic aerodynamically, and the four cylinders around at the time GS1000 Z 1000 GS1100e etc were as quick if not quicker. Honda did 5 and 6 cylinder race bikes as mentioned already these were much smaller than the CBX . Have you looked at the web bike world site? l think you may like what you see. they do it because they can like a lot of concepts its to show what they can do .worked sat mornings in local bike shop as a kid and to see these monsterous bikes go out every week to new customers was a joy ,tyhen came along the z1300!